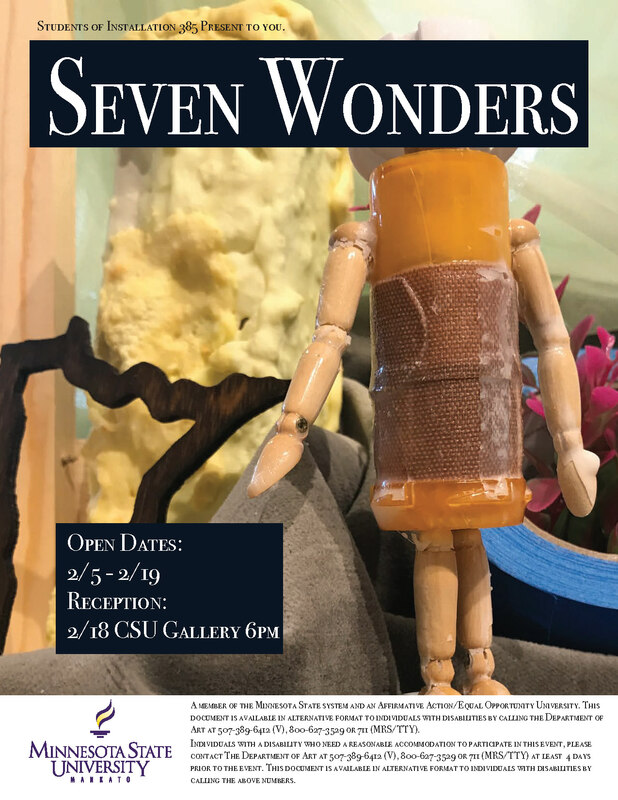 Seven Wonders is an exhibition of student work from the Intermediate Installation course at Minnesota State University, Mankato. Seven distinct installations are unified by a recurring “viewer” immersed within each wonder. While a diverse range of students with various material, process, and conceptual interests are represented, they are united by their shared interest in manipulating materials to intervene on specific spaces and the audience’s experience within them. Exhibition runs Feb 5-19th. Closing reception is on Mon, Feb. 18th at 6pm. Gallery hours: 6:30am-11:59pm Monday through Friday, 8:00am-11:59pm Saturday, and 10:00am-11:59pm Sunday. Hours are subject to change.